Story: During the Warring States period the Zhao army marches through the country. Along its conquering expedition they want to annex the small town Liang. However, the incompetent king of Liang has ordered a representative of Mozi philosophy, who are well-known throughout the country as excellent strategist. 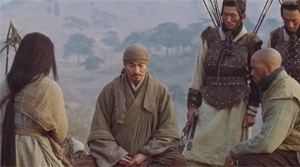 Ge Li (Andy Lau) may never before have defended a city, but his skills leave no doubt that he is just the right man to defy the 100.000 men strong army of Xiang Yanzhang (Ahn Sung-Ki). At first Ge Li has difficulties being accepted by prince Liang Shi (Choi Si-Won), though, who doesn't like at all that Ge suddenly gets complete military authority. Yet, the master strategist is supported by cavalry chief Yi Yue (Fan Bingbing), who apparently has a romantic interest in the man as well. 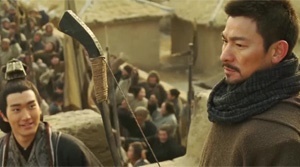 Ge Li is so successful in defending the town that he also gains the respect of the Zhao general. But as things progress Liang's king isn't happy at all that Ge Li gets so much support from the people and he even starts to believe that Ge might soon spearhead an insurrection. Review: "Battle of Wits" surely eluded many, even though you constantly heard about the movie. The reason for that is pretty simple: This in every way solid war epic taking place during the Warring States period somewhere around 370 B.C. manages to be entertaining thanks to numerous fights on the battlefield and also offers a few appealing motives, but they are never truely explored in an adequate fashion. Thus, the movie stumbles across different themes and doesn't seem to have any manifest intention. You constantly believe watching a war movie which is a bit different and which wants to stand its own ground off the beaten track of armies and arrows multiplied by CGI-effects by also showing the strategic aspect of warfare, but in the end "Battle of Wits" is continuously faltering and can't fully be a pleasing affair. The plot's core by the way is based on the manga "Bokko" by Hideki Mori and it is actually intrigueing. Mohism, which was brought into life by the philosopher Mozi, really existed after all until it has been eradicated during Qing dynasty. Roughly speaking it teaches a universal love and aims at protecting what you love. Ge Li is a student of that philosophy and as it turns out has never before defended a city, contrary to his comrades. Yet, his skills almost have to be called godlike. The leader of Zhao army doesn't stand a chance against Ge Li at all despite all the years of experience he has, not even during a game of chess. This deprives the story of some tension as the only thing we can do is looking forward to what kind of stroke of genius Ge might present us with next. But there are dangers for the master strategist, too, namely when he is regarded as a threat by his client. That is when one of the movie's strengths comes to the foreground. "Battle of Wits" can be pretty gritty. Thus, it's even the more disappointing that the events on screen can't really move us. 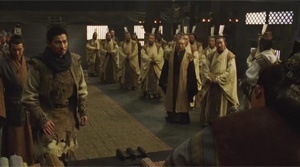 Andy Lau ("A Simple Life", "A World Without Thieves") succeeds in bestowing charisma on his pacifist strategist, yet the suddenly inserted elaborate dialogues, which seem solely motivated by the script and in which Ge denunciates killing and therefore looks almost naive, are out of place. Ahn Sung-ki ("Unbowed", "Musa"), actually a great actor, looks unnecessarily shallow, is often outshined by Lau in the scenes they share and he also has a few difficulties with the pronunciation of Chinese. One of the reasons why "Battle of Wits" is so unfocused is surely its love story. Fan Bingbing ("Sacrifice") doesn't convince at all as the tough female warrior since she behaves like a love-sick girl most of the time. Additionally, the romantic side story's spark never ignites and accordingly the finale seems rather clumsy in that respect, too. Then there is also the incapable king who sometimes acts so stupid concerning the decisions he makes that we start to wonder how his people actually survived under his reign all this time. And when we aren't taken to the battlefield we are constantly told that war is a needless thing and that killing is only acceptable when it serves self-preservation and protecting the ones you love. But even then there are often enough moral predicaments. If the movie had digged some more here there possibly could have been brought to light something worthwhile. When the action kicks in, and that is the case often enough, there is in fact not much to complain about. The battles are harsh and there is no unneeded whitewashing, yet they also don't feature that much blood. The clashes are epic in scale as well and are accompanied by a fitting soundtrack by Kenji Kawai. Only in some scenes a few CGI-effects have found their way into the film which don't look that convincing. However, as already stated the action isn't a big problem after all, but the story which wants to cover too much at once and accordingly only touches its themes. This particularly concerns the characters, leading to us being more emotionally involved by the city itself than by the sketched individuals. Unfortunately, director Jacob Cheung shows that he isn't capable of pulling all the strings, because a lot of story threads are simply dropped all of a sudden. Therefore, "Battle of Wits" counts among the many Chinese war epics which are actually worth watching in a way, but lack real heart.